added 14/10/2008: today, an interview of Renaud Braye, whose special opening attracted the attention of Ranka http://ranka.intergofed.org/ ! The World Mind Sport Games has started on 4th of October in Beijin (China). These event has been created to launch for the 1st time in history a sort of paralel Olympic Games for the intellectual games. Five games are represented: bridge, occidental chess, drought, xiangshi (chinese chess) and...yes of course...go ! More than 140 countries have sent delegation. and Kristof Bossee, 1-k, playing the "individual open" as our "official number 1 representative". The 5 will also play the team competition. (the 4 made all 2 out of 6 and Kristof 3/7, that means, no medal for this Olympiads ! 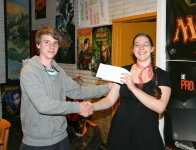 François Gonze won the student category and Simon Fain won the youth category. Winner of this edition is Park Jong Wook, only player with 9 victories. Cheng (who ended 2nd in the 2004 WAGC and 5th in the 2007 WAGC). favourite and winner last year, Ilya Chikchine. (among wich one against Dinerstein)! The results of the participating Belgian were rather good. is now promoted to 3-d level. Congratulations to him ! The photographs of the Korean Prime Minister's Cup Selection Tournament and Ghent Go Tournament are now available in the galleries. There are also photographs of the lesson given by Kang Seung Hee. BelgoNet 18 is now available in the member section. François Gonze won the Korean Prime Minister's Cup Selection Tournament and will be the Belgian representative for the Korean Prime Minister Cup in November. Thomas Connor and Nelis Vets finished respectively with the second and third place. 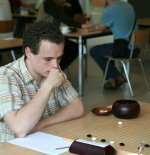 Willemkoen Pomstra, from Netherlands, won the Ghent Go Tournament, followed by Siu Hong Chung and Kristof Bossee. The Belgian representative Alain Wettach has finished on the 37th place in the 29th World Amateur Championship in Japan. He scored 4 victories and lost 4 games. The Korean Ha Sung Bong won the championship with a perfect 8/8 score. Second place was for the Chinese Guo Yuzheng and thirth Fernando Aguilar, both with 7/8. Best European was Cornel Burzo (Rumania) on rank 7.